Dear Mr Corbyn – or may I, a non-Corbynista, call you Jeremy? I am one of the many Labour party members and supporters, including your critics, who unreservedly applauded your big speech on 14 April setting out Labour’s powerful case for Britain remaining in the EU. You were right to draw a sharp distinction between the Labour and Tory arguments for staying in, including your striking health warning that following Brexit our right-wing government would make a bonfire of the EU’s hard-won protections for workers’ rights, so intensely disliked by the Tories. You were absolutely right to argue that the EU could and should do even more to safeguard liberal rights and values throughout our continent, more about climate change, more reforms “to end … self-defeating austerity and put jobs and sustainable growth at the centre of European policy,” as you put it – and that we can work to promote these causes only by remaining in the EU and fighting, alongside our progressive European allies, for reform from within. We need to hammer home your vital message that a vote to Remain is not the same thing as a vote of support for Cameron and the Tories. So I respectfully congratulate you on an excellent start to Labour’s Remain campaign. Alan Johnson and others are continuing to make the Labour case whenever they can. But since your speech on 14 April your own indispensable voice as both party and Opposition Leader has been strangely silent on this overwhelmingly important issue. A large majority of younger voters, especially those on the centre-left, agree that Britain should stay in Europe and that turning our backs on our continent would be a disaster: so the main aim must be not just to strengthen their support for the In cause, but even more importantly to inspire them with vigorous enthusiasm for it so that millions of them will turn out to vote. The main hope of the Brexiteers lies in the relative apathy of the pro-Europeans and the widespread weakness of their commitment to turning out to vote. There are several ways to get out the pro-Labour pro-EU youth vote. First, let them, and everyone else, hear your voice and your arguments, loud and clear, all around the country, three or four times a week from now until the vote on 23 June. Please, please make this your top priority until then. Don’t hesitate to repeat yourself over and over again, perhaps also introducing a new theme and sound-bite each week. Secondly, don’t mind being accused of scaremongering. Virtually every well-informed institution, reputable economist and political leader around the world calculates, often based on rigorous analysis, that leaving the EU will hugely damage Britain in all sorts of ways. That is scary: so it’s the duty of a political leader to pass on the warnings and endorse them. Thirdly, heap ridicule and contempt on the feebleness of the Out campaign’s responses to the pro-European arguments for staying in – their almost total failure to rebut the facts and figures underlying the Remain case, falling back instead on puerile complaints of bullying, threatening, blackmail and scaremongering. Don’t hesitate to point out the low calibre (and often ulterior motives) of the majority of the Out leaders, especially the shady clown Boris Johnson, the ideologue Gove who launched the destruction of state education in England, the saloon-bar lout Farage, and the low-grade obsessives and has-beens who cheer them on. 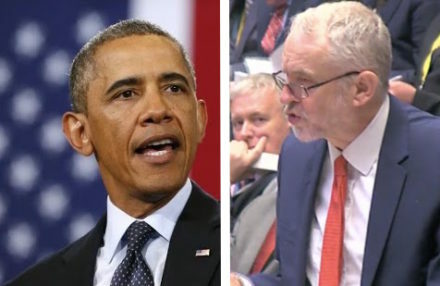 You might also build on the helpful pro-Remain remarks by Barack Obama during his visit, by pointing out that we should all pay careful attention to the friendly advice to stay in the EU courteously offered by President Obama during his visit. As the most progressive American president for years, he had the right and the duty to share with us his view of what would be in the best interests not just of Britain and the US but also of the rest of Europe and the wider western world. If possible you might say something about your own private exchange of views with him in London. Lastly, I hope you would deploy an argument that has hardly been deployed by the Remain leaders hitherto. As a major influential European country which has for centuries exercised a mainly positive influence in European affairs, we have obligations towards our continental friends and partners, especially at this time of crises (refugees, global terrorism, climate change, economic doldrums and Eurozone blues, gross global and national inequality threatening the whole economic and social system, Russia). To walk away from the common European effort to address all these problems, at this time especially, would be a treacherous and shaming betrayal of our obligations towards our fellow-Europeans. We should think about the effects of our decision on them, and on the wider world, not just on ourselves. Jeremy, this issue presents a huge opportunity for you to confound your critics by repeatedly speaking out on a major political, economic and moral issue that unites, not divides, your party and the wider Labour movement. By doing so you could dispel many of the doubts that have surrounded your leadership. Your eloquent and inspiring championship of this great cause can help save Britain from disaster, unify and put new purpose into the Labour party, and establish you personally as a credible and effective national leader. It’s a no-brainer. Good luck! Brian Barder is a former British ambassador and the author of What Diplomats Do. He runs his own blog.